Jack knows he’s a flirt. He’s a hit with the ladies — and men — but it means nothing to him because he’s with Aiden. They’ve been together in a committed relationship for years now, and in Jack’s mind, no one else matters. So when a new girl in the office named Leslie flirts back, Jack thinks nothing of it. Aiden, on the other hand, is pissed. The worse part is Jack won’t tell Leslie he’s with someone. He doesn’t think he has to. 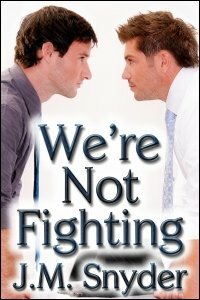 Soon the tension between the two men starts to wear them down. Jack just wants the whole thing to blow over, but it looks like Aiden’s about to blow up. When Jack finally says something to Leslie, will it be too late to satisfy Aiden? Aiden didn’t trust her, and he never let her out of his sight. Whenever she tried to talk to Jack, Aiden was there to interrupt. She’d hang out in the employee lounge, hoping to catch Jack on break, but Aiden followed him into the room and, when she asked what Jack’s plans were for the weekend, it was Aiden who answered. She’d try to get Jack alone in the gym during lunch and Aiden started joining his lover during their workouts. He was always there. Always. “I don’t like her,” Aiden told Jack when the lights were out and they lay together in bed. “I can get you in the mood.” Jack kissed his earlobe, his jaw, his chin.